This June, HIV turns 27. It was in June 1981 that the Centers for Disease Control and Prevention first reported cases of what was to be called AIDS. This November, I will turn 27 too. It was in November 1981 that I was born—and got a blood transfusion that gave me HIV. But my family and I didn’t learn I was positive until I was 12. Unafraid, I told everyone in my 7th-grade class—and made the news as one of the first openly positive kids in Rhode Island. My classmates were pretty cool about it, considering it was 1993 and we didn’t know as much about AIDS as we do now. It’s weird realizing that I am almost exactly the same age as HIV. The virus and I have both been through a lot of changes together. HIV has grown to become considered “manageable” by a lot of people. And my life is pretty manageable now also. 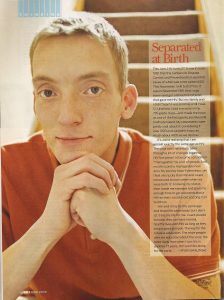 My journey hasn’t been easy, yet I feel very lucky that HIV and I were introduced to each other when we were both 12. Knowing my status then made me stronger and gave me enough time to get educated about HIV so that I could avoid passing it on to others. HIV and I may be the same age and share the same body, but I don’t let it live my life for me. I want people to know they can have normal, healthy lives with HIV as long as they keep a good attitude. The key for the future is education. The more people who are educated about the virus, the more likely that when I turn 54, in another 27 years, HIV won’t be along for the party.